How would you react to the prospect of surgery? Dean emailed me last week to ask if he should sign up for the New York Marathon. Prudence held the day, but he's looking forward to adventure racing in 2009. However, it's going to be a long haul. He's in bed on a machine that rehabilitates his knee by slowly moving the joint (I bet adventure racers don't get that on the NHS). He tells me that it moves 150 degrees per minute, and bends his knee to 85 degrees (which takes approximately 65 seconds - on his facebook page Dean lists "practical maths" as one of his interests). He is required to do at least 500 repetitions per day. Sound like fun? You should visit his facebook page and request to be his friend, because I would imagine he's going spare. He's going to be measuring and counting every one. He's even started collecting and speaking to soft toys. I have no doubt that every reader of this page has contemplated the prospect of injury over the past six months (and if not, shame on you); Dean has been out of action for a year, and has been forced to concentrate on his job. 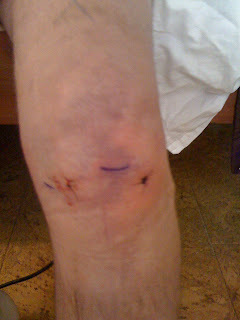 So say a prayer for Dean and wish his knee a speedy recovery.